PomoNews.com: OIC accuses Prague of "Islamophobia"
OIC accuses Prague of "Islamophobia"
About 600 people rallied against Islam in Prague on Friday Jan. 16. In a counter demo about 20 people demonstrated for the rights of Muslims and other religious groups. We Do Not Islam in the Czech Republic group demonstrating outside Prague Castle, the seat of the Czech heads of state. UPDATE: Following last week's demo in Prague against Islamization, the nefarious OIC (Organization of Islamic Cooperation) has sprung into action, issuing a joint statement to accuse the country in effect of "racism". The OIC is the driving force behind the legal adoption of blasphemy and the non-concept, Islamophobia. Read it all! There were no incidents, only verbal exchanges during the rally that lasted about an hour. 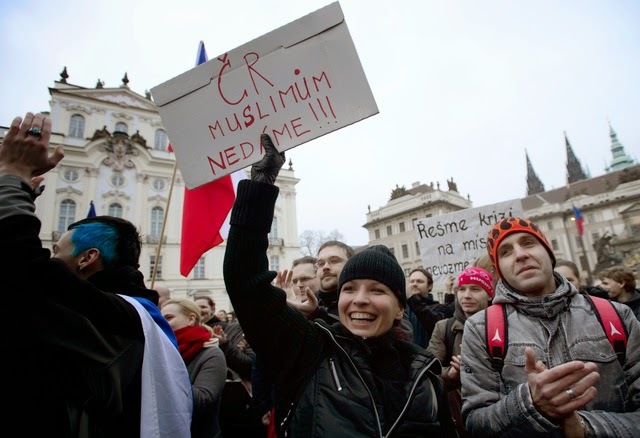 The opponents of Islam carried Czech flags and posters saying "Europe, Wake Up!" "There Is No Moderate Islam" and "Islam Is Evil." The organisers were also distributing posters and stickers with the group's logo in the form of a crossed-out mosque. From the politicians, the rally was attended by Marek Cernoch, deputy chairman of the populist Dawn of Direct Democracy, and Jana Cernochova, deputy chairwoman of the deputy group of the right-wing opposition Civic Democratic Party (ODS). Dawn head Tomio Okamura also appeared in the crowd. "We want to preserve the Czech tradition, irrespective of what religion may challenge it," Cernoch said. An amendment to the church law, drafted by the We Do Not Islam in the Czech Republic group, is the first step towards this, he added. The legislation is to prevent the dissemination of radical ideas. A church or religious community demanding special rights should not come under the suspicion that it will threaten the Czech Republic' foreign political interests, national security and public order, the draft amendment says. The secret services and the police should express binding opinions on their applications [for the special rights enjoyed by churches in the Czech Republic], according to the draft amendment. Cernochova said the people protesting against Islam were no extremists. "I wish representatives of the Muslim community in the Czech Republic were here with us and clearly distanced themselves from what is going on in Europe and in the world," she added. Human Rights Minister Jiri Dienstbier (Social Democrats, CSSD) has expressed disagreement with the demonstration. "It is rather useless to provoke fear and hatred because we have not recorded any Islamist threat in the Czech Republic," Dienstbier told CTK. "Pigeonholing people, the principle of collective guilt and intolerance that is being applied here, though so far by a relatively small group of people, is a very dangerous concept that contradicts the principles of freedom and democratic society," he added. The opponents of the rally carried posters saying "[First Czechoslovak President Tomas Garrigue] Masaryk Would Not Be Afraid" and "We Do Not Want Hatred in the Czech Republic." Before the rally, its organisers said they also wanted to honour the memory of the victims of the recent terrorist attacks in Paris. "We will inform the public about our view of Islam and its expansion in Europe. We will name the risks for the Czech Republic and raise legislative and security demands whose acceptance will prevent Islamisation of our country," organisers said in their press release. The Muslim Community Centre (UMO) in the Czech Republic has said the behaviour of the Paris attackers on the Charlie Hebdo paper had nothing in common with Islam. UMO chairman Muneeb Hassan Alrawi told CTK after the attack that Muslims in the Czech Republic were facing death threats, mainly online, targeting them indiscriminately.